Caspoc is a Simulation and Animation program for multilevel-multidomain simulation and Model-Based Design. It supports circuit and system-level design, simulation, animation and automatic code generation. 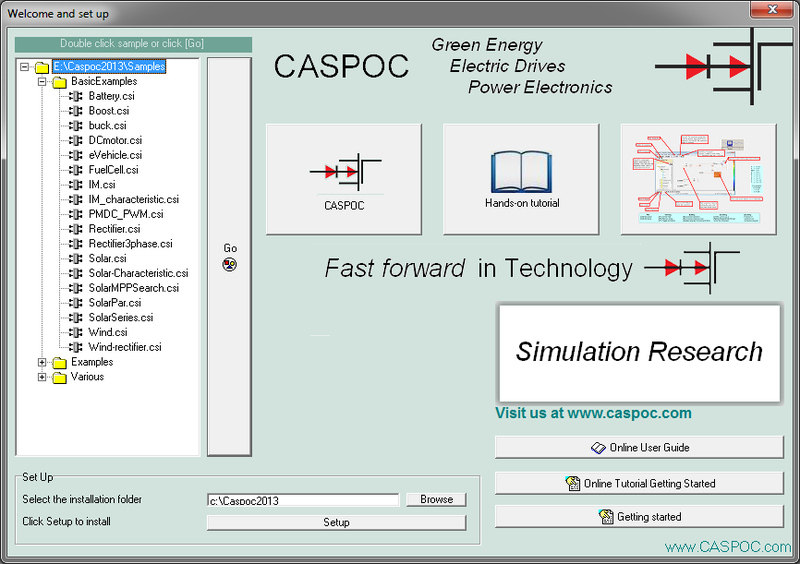 Caspoc provides a graphical editor, customizable block libraries, and solvers for modeling and simulating electric circuits and dynamic systems. This documentation is readable on Mobile devices. A step by step guide showing you to build a single phase rectifier in Caspoc. Select your language of choice for this getting started tutorial. Het maken van een hardcopy op de printer. Read about the various user interface topics and the special components in Caspoc. Detailed info on each component is given in the Reference Guide. 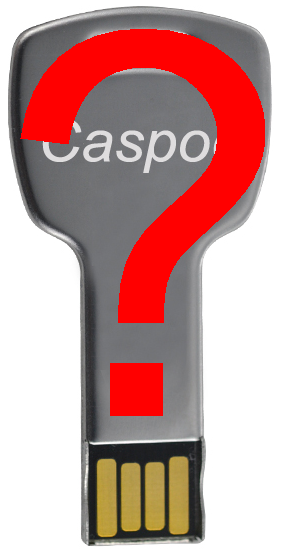 Find more details on any component in Caspoc. 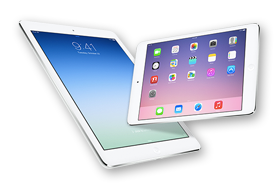 Application examples are given in the User Guide and Hands-On. Model parameters in include files. View the contents of a library block. Add a picture to a library block. MODEL - Ideal Semiconductor Parameters. TESLA - Tesla Electrical machines design tools. EDGENP - Detection of a treshold passing with positive slope. EDGEPN - Detection of a treshold passing with negative slope. MULTISIM - Index for the multiple simulation. AL - Heat sink from aluminium. AssembledHeatSink - Assembled heat sink with case. Foil - Electrical isolation foil between semiconductor and heat sink. Aluminium - Heat sink from aluminium. What is new in CASPOC 2015, A Simulation Experience! Is everything in one window? I changed the color of the waveform, but he did not change it in the scope? How can I change the time scale in the scope? What extensions to use for include files? Where to store the include *.mod files? Can I store Scope-data, HTML-data, commands, options or include files in an exported *.LIB file? Can I zoom the schematic with the cursor keys? Can I scroll the schematic with the keyboard? The animated object has a distorted color? It seems that the arrows in the SCOPE and some animated objects are not nicely redrawn, when I continue the simulation? How can I speed-up the animation? The schematic in the exported HTML or EMF file is not looking so nice? Is there a variable time step? Why are there no Spice models? Why is not every nodal voltage and component current stored in data-files during simulation? Are there standard models for semiconductors? Can parameters for semiconductors be defined? Can .Model parameters be used for any type of model? How to model mechanical systems like drive-chains? Are there models for State Machines? Can State-Space equations be included as the model? Why is there no script language for definition of functions? Is there a replay function of the simulation results? What if the step size is not matching with the switch intervals, such as with PFM? Is there some post processing in the Scope? Can I rotate a component while dragging it on the screen? Get help on the buttons in the button bar? Get help on the menu items? Switch the language of the user interface to German? Start Caspoc from the desktop? Perform auto scaling at the end of the screen? Zoom in a Scope window? Open the dialog box for scope input properties? Open the dialog box for scale properties? Connect the input of a scope? Move a selected part of the schematic? Open a Caspoc file (*.csi) from the explorer? Make a voltage source dependent on a block-diagram value? Define constant values for inputs of a block-diagram component? When I create my own library block, can I add some help notes? Is there a coupling to Field solvers like FEM and BEM? Can I include magnetic couplings from packaging in my model? Are there any other probes than the Voltage and Current blocks? Is there a model for the synchronous generator? Is there a dynamic model for the Mosfet? Are there models for modeling heatsinks? Are the scopes storing the auto-co-ordinate values? Can I label the scopes? Can I use the K element for coupling inductors inside a library block? Are there any formulas for modeling non-linear capacitance? Is there a block for weighted summing of inputs? Can I use Library blocks inside another library block? Are there multidimensional lookup tables? Can I evaluate expressions in a block? After the analysis the cursors do not stay on the waveforms? How do I get a log representation for the frequency and dB representation for the amplitude? How do I modify the frequency range of the small-signal representation? How can I see what my circuit is doing during the small-signal analysis? I performed a small signal analysis, but I do not see the transfer function in my tiny scopes? Can I have more than one input per scope during the small signal analysis? If I change the number of harmonics to be displayed, do I have to perform another small-signal analysis? Is current measurement through controlled sources possible? How to change the gain in a controlled source? How to include a Spice netlist, Spice options or a Spice .Model? How long can file names be? What is the format of numerical data files for the Lookup Tables and the Scope? What are the restrictions when using the Simulink coupling? I make changes in a sample or library block, but it looks like it has no effect or gives only errors.